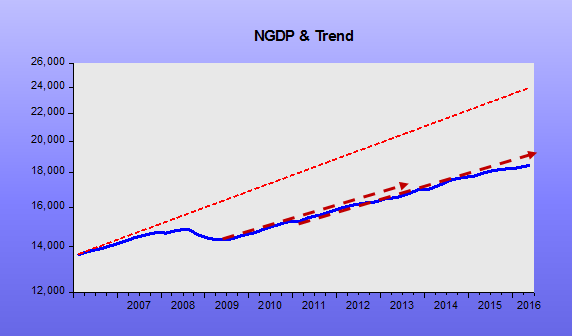 After a six-year run, during which Historinhas helped spread the Market Monetarist approach, this blog will undergo a metamorphosis, becoming NGDP-Advisers. The blog will continue but be augmented by new products that will be available via subscription.”. In watching the U.S. and global economy since 2008 (and before) it has become obvious there is a dearth of financial advice that is informed by Market Monetarism, or even close attention to nominal gross domestic product (NGDP). A recent Economist magazine study of the International Monetary Fund’s national economic forecasts from 1999 to 2014 found, “Over the period, there were 220 instances in which an economy grew in one year before shrinking in the next. 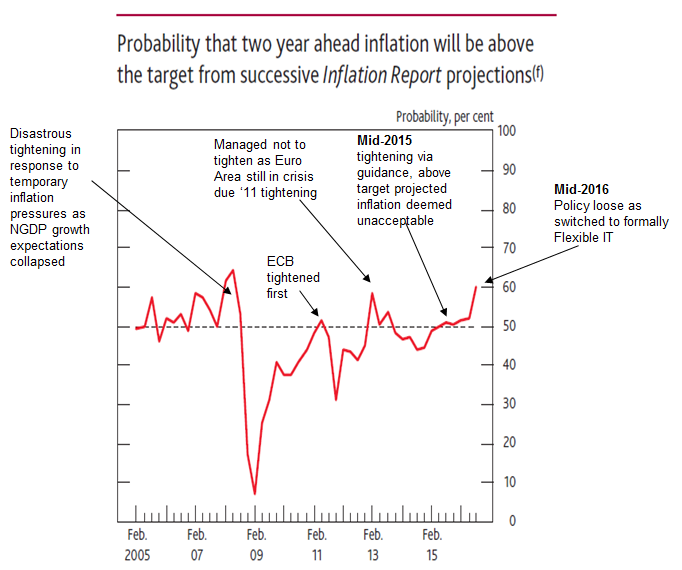 In its April forecasts the IMF never once foresaw the contraction looming in the next year.” Not once! Something is wrong in economic forecasting. NGDP-watching is not a forecasting cure-all. However, Historinhas and the Market Monetarists have time and again been proven right on macroeconomic matters when the establishment was wrong. When old-school monetarists feared hyperinflation from unconventional easing measures, Market Monetarists correctly saw the real risk was still tight money. When Keynesians predicted recession from cuts in government spending during the 2013 US fiscal cliff episode, Market Monetarists anticipated the monetary offset and were proven right. When central banks in Europe raised interest rates in 2011, Market Monetarists called this for the debacle that it became. It is time to bring these insights from the world of blogging, into the realm of macro forecasting, time to unseat the hopeless “experts”. The bedrock of our approach is a healthy fear of market efficiency, though our approach still has important advice for investors. Many have missed historic bond rallies since 2008, so certain were established advisers that an inflationary surge, or even hyperinflation, was pending. Equity investing is equally tricky. Central bank monetary policy sometimes feels like a game of blackjack, random. Time and again in its history, the Fed has tried to tighten (in recent years), or loosen (in earlier eras), yet been beaten back when markets question their view of economic reality. It is hard to forecast how stubborn a central bank will be in such situations and when it will inevitably buckle, but our approach frames the issues correctly, allowing all investors to understand where their risk lies. At NGDP Advisers, we hope not only to continue our examination of the global economy, but also to recognize realities and advise accordingly. We’ll yell from the cliff tops ‘what should be’, but we’ll also help you get ready for what ‘will be’. market yields. Under this assumption, demand growth is expected to be sufficient to return inflation to the target within two years. Inflation then moves slightly above the target in the third year of the forecast period as sustained growth leads to a degree of excess demand. As the UK expansion progresses, speculation about the precise timing of the first move in Bank Rate is increasing. This is understandable and is another welcome sign of the economy returning to normal. The likely timing of the first Bank rate increase is drawing closer. The MPC’s Remit recognises that when the effects of shocks persist over an extended period, the MPC is likely to face an exceptional trade-off between returning inflation to target promptly and stabilising output. When this is the case, the Remit requires the MPC to explain how it has balanced that trade-off, including the horizon over which it aims to return inflation to target. Fully offsetting the persistent effects of sterling’s depreciation on inflation would require exerting further downward pressure on domestic costs. And that would mean even more lost output and a total disregard for higher unemployment. In the Committee’s judgement, such outcomes would be undesirable in themselves and, moreover, would be unlikely to generate a sustainable return of inflation to the target beyond its three-year forecast period. As a result, in order to mitigate some of the adverse effects of the shock on growth, the MPC is setting policy so that inflation settles at its target over a longer period than the usual 18-24 months. If, as he says “I joined the Federal Reserve because I want to help tackle the most important economic policy challenges we face as a country”, he´s wasting his time at the Fed! Throughout the “Great Inflation” Arthur Burns argued that inflation was a nonmonetary phenomenon (Unions, Oligopolies, Oil Producers, etc.). Now, the view remains the same “throughout the “Great Stagnation”! The Great Recession has had long-lasting effects on credit markets, employment, and output. This column combines a model with macroeconomic data to measure how the recession has changed beliefs about the possibility of future crises. According to the model, the estimated change in sentiment correlates with economic activity. A short-lived financial crisis can trigger long-lived shifts in expectations, which in turn can trigger secular stagnation. The typical post-WWII recession has a distinct trough, followed by a sharp rebound toward a stable trend line. Following the Great Recession, however, this rebound is missing. The missing recovery is what Summers (2016) and Eggertsson & Mehotra (2014) call ‘secular stagnation’ (see also Teulings and Baldwin 2014). Why did the dysfunction in credit markets impact the real economy for so long? Many explanations for the real effects have been advanced, and these are still being compared to data (e.g. Gertler and Kiyotaki 2010, Brunnermeier and Sannikov 2014, and Gourio 2012, 2013). Existing theories about why the crisis took place assume that the shocks that triggered it were persistent. Yet such shocks in previous business cycle episodes were not so persistent. This differential in persistence is just as puzzling as the origin of the crisis. What most explanations of the Great Recession miss is a mechanism that takes some large, transitory shocks and then transforms them into long-lived economic responses. Perhaps the fact that this recession has been more persistent than others is because, before it took place, it was perceived as an extremely unlikely event. Today, the question of whether the financial crisis might repeat itself arises frequently. Financial panic is a new reality that was never perceived as a possibility before. 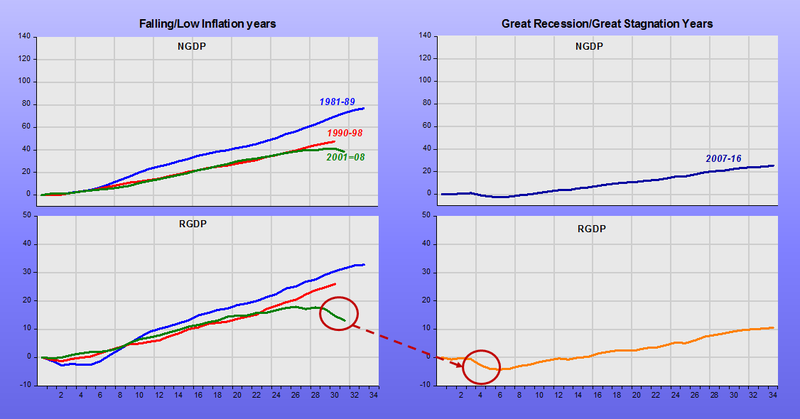 I believe there´s a simpler and more direct explanation – or mechanism – consistent with the changes in “beliefs, expectations or sentiment” which, in addition to helping understand the fall in productivity growth, is also consistent with the post war history of the behavior of RGDP depicted in the chart above. 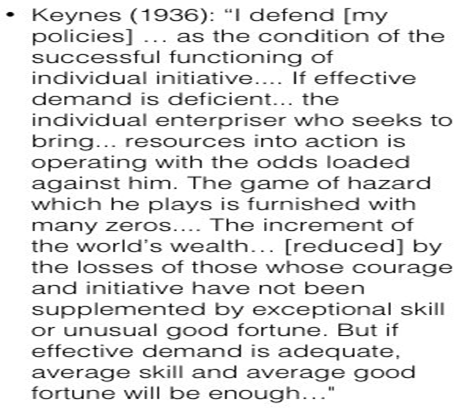 That alternative explanation relies on observing that what is manifestly different in the present cycle is the behavior of monetary policy, if you understand monetary policy to be the main determinant of aggregate nominal spending (NGDP). My strategy divides the post war period (actually the period after 1953, to avoid complications from the immediate post war years and the period of the Korean War) in four parts. 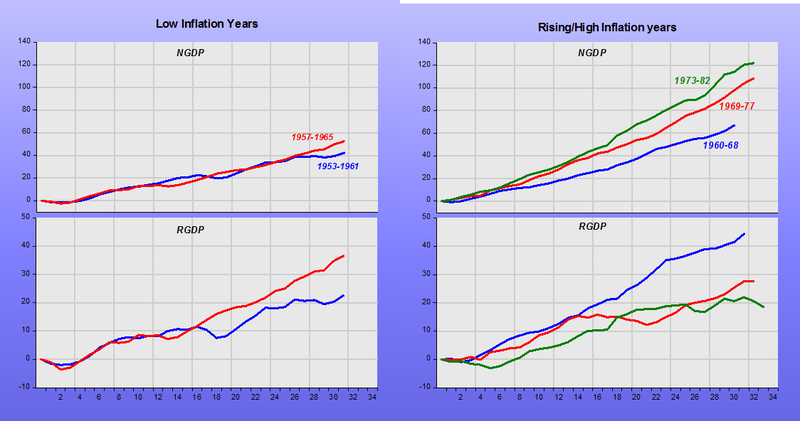 The “low inflation” 1950s and early 1960s, the “rising-high inflation” of the late 1960s to the early 1980s, the “falling-low inflation” years from the mid-1980s to 2006, and the “Great Recession/Great Stagnation/Too Low Inflation” years thereafter. In this story, it´s not “the tail that wags the economy”, but the “hydra-head” of the FOMC, who wields close control of aggregate nominal spending in the economy. The panel depicts NGDP and RGDP during the four episodes. All corresponding charts have the same scale and they cover the period from the peak of the cycle to 28 quarters from the trough (which is the time span since the Great Recession ended in June 2009). 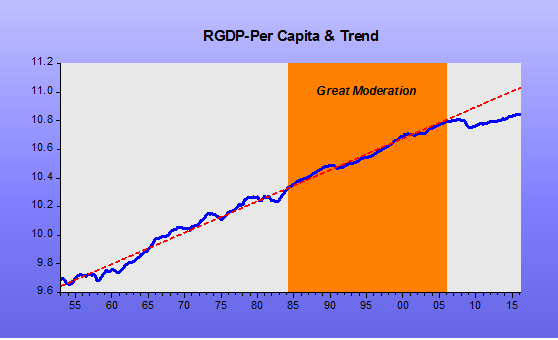 From looking at the behavior of NGDP and the associated behavior of RGDP during the episodes, it becomes clear why we´re living a Great Stagnation. For the past 60 years, monetary policy has never been this tight! That´s the mechanism that transforms transitory shocks into long-lived economic responses. It’s taken a while but the evidence is now in. 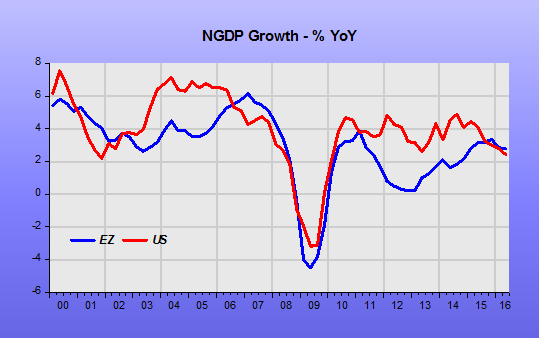 Euro Area NGDP growth has overtaken US NGDP growth. Congratulations to the ECB, commiserations to the Fed. Go Europe! Sadly, it is not quite so simple. While the Fed has much to atone for letting NGDP drift so far off trend, the ECB has much more below trend growth to make up as the growth “gap” since the Great Recession makes very clear. 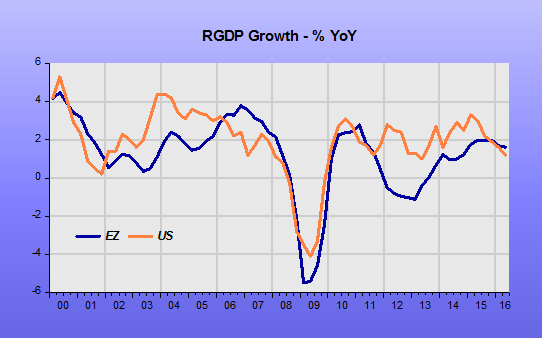 For those who prefer “Real” GDP, i.e. a real number GDP deflated by inflation, then we can also see a similar pattern of Europe overtaking the US. The main reason for this Euro Area relative resurgence is that monetary policy remains on a tightening bias in the US despite these terrible trends in Nominal and Real GDP, while the ECB is still very much in easing mode. The trends are equally visible in Base Money growth: 6% down YoY in the US, 30-40% up in the Euro Area. Germany (29%) – NGDP slowed to 3.2% YoY in 2Q 2016 from a 3.6% trend over the last five quarters. It seems to have been driven by a fall in the deflator rather than RGDP growth which was stable at 1.7% YoY. France (21%) – still growing at over 2% YoY NGDP doesn’t sound exciting but is very good for that country which has a terribly sluggish nominal economy hidebound by labor regulations and other restrictions. QoQ growth was 0%, which wasn’t too bad given the country had terror attacks and a major football championship keeping people away from the shops. Equally, keeping large parts of the labor force out of the economy as evidenced by its very low Labor Force Participation and Employment/Population ratios helps France´s productivity statistics but doesn’t make the country happy or grow very fast. Italy (15%) – Despite the long-drawn out saga of the low nominal growth-inspired banking crisis, NGDP growth in Italy is above 2% for a second quarter running, helping keep RGDP positive YoY. ECB monetary policy is set for the average grower inside the Euro Area and Italy is very definitely average. Spain (10%) – NGDP picked up after a 1Q2016 dip but did not regain the 4% recorded in 2H 2016. Still, it is very welcome given the political chaos engendered by not having a government and as the country has much catch up to do in terms of lost NGDP growth during the double dip recession. Even writing these mini-report cards on various regions within the Euro Area, one feels very conscious that one is approaching the monetary area the wrong way. It is, or should be, seen as one bloc but the national politics keeps interfering. It mirrors the tension between the permanent Federal Reserve governors and the regional Fed presidents on the FOMC. The US is far more of a single market than the Euro Area but can still see tensions, especially when the central governors are two seats short due to nomination blocs by Congress on Presidential appointees. Perhaps the sheer diversity of ECB council members strengthens the central officers in a way Janet Yellen can only dream. Who knows? But what is clear is that the ECB is on the right path at the moment while the Fed is not.